The second Clinton-Trump debate had about 20% fewer viewers than the first face-off did. Why the drop-off? The "Sunday Night Football" game was definitely a factor. There is speculation that the ugly, bitter nature of the presidential campaign also had something to do with it. "I think people are repulsed by it now," a senior TV executive said Monday morning when the overnight ratings came in. The audience was still massive by any measure. The six biggest channels that televised the debate -- CNN, ABC, CBS, Fox News, MSNBC, and the Fox broadcast network -- had a combined 60 million viewers. With the addition of Spanish language broadcasters and smaller channels, the total reached 66.5 million. 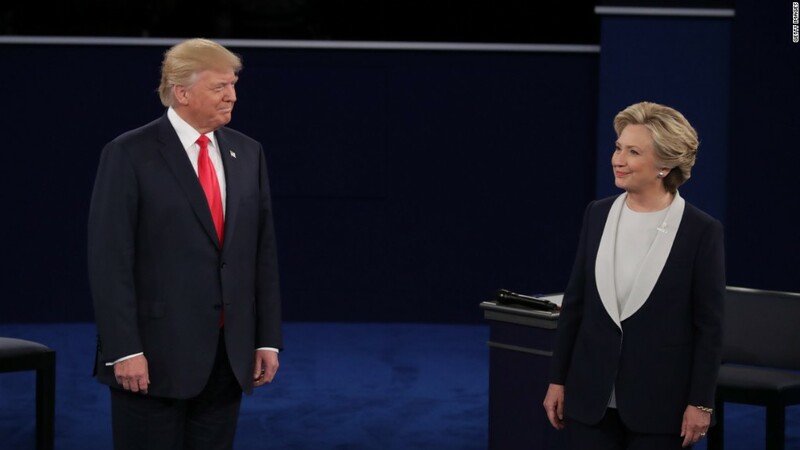 For comparison's sake, the first debate, held on September 26, averaged 84 million viewers via TV, setting an all-time record for presidential debate viewership. Millions more people watched both debates via the Internet. In the days leading up to Sunday's rematch, TV executives predicted that the second debate would have a slightly smaller audience. A chief reason: one of the big broadcast networks that aired the first debate, NBC, showed the Giants-Packers game during the second debate instead. The game attracted more than 15 million viewers, which accounts for some of the decline between debate #1 and debate #2. There are other factors too, like Hurricane Matthew, which displaced families and disrupted power (by extension affecting television ratings) in some Southeastern markets. But some analysts immediately wondered on Monday if campaign divisiveness -- driven by Donald Trump -- is also partly to blame. Fox Sports research guru Michael Mulvihill tweeted, "Have to say I'm surprised and maybe a little encouraged by debate decline. Looks like it's finally gone too far for millions of people." Ken Bone, a town hall questioner who became an overnight celebrity, may have said it best. "It felt almost like watching mom and dad fight. It got very uncomfortable," he told CNN's Carol Costello on Monday. While that is true, the ratings remained relatively steady from the beginning until the end. Some channels fared better than others. CBS, which was boosted by NFL coverage earlier in the evening, had the biggest overall audience, with more than 16 million total viewers. ABC had 11.5 million viewers and CNN had 11.3 million. ABC's Martha Raddatz and CNN's Anderson Cooper co-moderated the debate. Sunday's match-up ranked as the most-watched general election debate in CNN's history. Fox News averaged 10 million viewers, Fox broadcast had 5.6 million, and MSNBC had 5.5 million. PBS had about 2.9 million and Univision had about 2.4 million. While the ratings fell between debate #1 and #2, online chatter was even higher the second time around. According to Facebook (FB), which crunched its numbers overnight, the debate between 9:03 and 10:37 p.m. ET was "the most talked-about debate on Facebook -- ever." The company found that about 20 million users in the United States were commenting, liking and sharing content about the debate. The same thing was true on Twitter (TWTR). "Tonight's #debate was the most tweeted ever," the company said afterward, "with more than 17 million debate-related tweets sent." Furthermore, Twitter said, Sunday was "the most tweeted day of the entire 2016 election, with nearly 30 million tweets sent." Both social networks found that Trump dominated online chatter, garnering a lot more "share of conversation" than Clinton. Many of the comments about both candidates were negative.